The Atlanta Contemporary currently has two exhibitions centered around regional identity. The group show It Can Howl, “takes a look at the numerous experiences of the American South.” The solo exhibition, The Dapper Comes to the Walkers collects Dapper Bruce LaFitte’s drawings of New Orleans marching bands and street scenes. The south is an enormous, sprawling region with shifting boundaries. It contains diverse peoples and places. It has long histories and complicated presents, evident in names and markers, statues and parades. It also has forgotten, hidden histories, absent from the stories we are told and we tell ourselves. These shows begin to expose the boundaries between what is seen and what we hide. In It Can Howl, the garbage cans of Nancy Lupo’s Train immediately grab the viewer’s attention as they snake across the gallery spilling their cherries. The walls of the garbage cans seem to waver with the weight they carry, the objects embedded within them compromising their integrity. 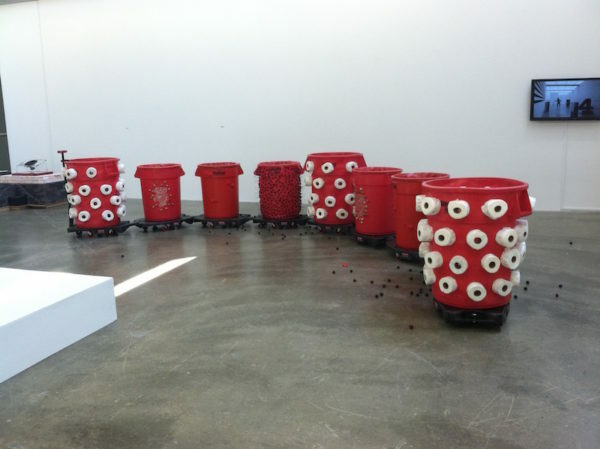 The blurring of real cherries and fake cherries, quail eggs and chocolate soccer balls gestures to and obscures the conspicuous emptiness of the garbage cans. The work fills the gallery with its overflow of materiality, yet it ultimately remains empty, a series of signifiers pointing to an absence hidden in front of us. Chloe Seibert’s Welcome is gouged and eaten into the wall to create the text. It is a greeting that speaks of absence, peeling back the layers of paint on the wall and drywall to the studs and hidden infrastructure. The wall text lists drywall as the only material, yet it is its absence that we see. The absent drywall removed to the storage room, to the dumpster, to the landfill is as much the work as what is left behind in the gallery. The visible absence points to the built history of the gallery and infrastructure that hides our waste and disposes what we have abandoned. Its gesture of welcome rings hollow within the gallery, but its removal resonates far beyond. 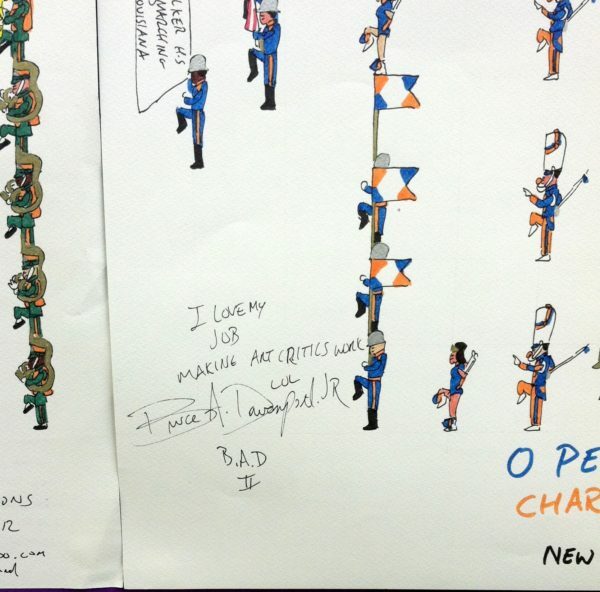 Dapper Bruce LaFitte’s drawings in The Dapper Comes to the Walkers point to specific moments. They are specifically sited to post-Katrina New Orleans, explicitly linked to a history and present experience of black life. They attempt to catalogue loss and absence through exacting, precisely enumerated presence. They are an accounting of people marching, people watching. The exuberance of their playing and the joy of their listening are flattened, frozen in time. This precision coexists with the narratives of Hurricane Katrina, the injustices that surrounded it, and the ongoing changes it has wrought on New Orleans. Lafitte is self-consciously aware of viewership and his presence within the art world. The text written across each of his drawing underscores the complicated presence of a gallery-represented, “outsider” artist within the institution. In writing “I love my/job/making art critics work/lol,” LaFitte is aware of his presence within the art world. The broken narrative he creates across his drawings attempts to connect the world from which he draws his experiences, love, and distress and the art world from which we view his drawings, yet our viewing environment remains a sterile white cube, however brightly painted in traditional Mardi Gras colors, forever divorced from the flattened drawings that contain so much life. The works in It Can Howl and The Dapper Comes to the Walkers are rich. The exhibitions are paired well, and the works individually and together continue to unfold and make me think deeply about what is visibly present in the gallery and what remains hidden, the objects of the art world I know how to see and the architecture that props them up, hiding in plain sight. I am new to this place. I am learning how to understand the heat and humidity, the new species of trees and insects. I am still attempting to understand its history and present and my place within them. I am only beginning to see the surface. I know there is far more hidden before my eyes.